Mainly clear. Low 62F. NE winds at 10 to 20 mph, decreasing to less than 5 mph.. Mainly clear. Low 62F. NE winds at 10 to 20 mph, decreasing to less than 5 mph. Strike Team 4 members interview Kim Simmons during the mock medical emergency simulation at the Kern County Public Health Services Department. Simmons was suffering from severe gas, bloating, watery stool and extreme fatigue as a result of a possible E. coli outbreak. Strike Team 3 members interview Ellie Bojorquez during the mock medical emergency simulation at the Kern County Public Health Services Department. Simmons was suffering from severe gas, bloating, watery stool and extreme fatigue as a result of a possible E. coli outbreak. Senior public health epidemiologist Kimberly Hernandez advises Strike Team 2 members during the mock medical emergency simulation at the Kern County Public Health Services Department. Strike team members go over their notes in the “Command Center” during the mock medical emergency at the Kern County Public Health Services Department. Teams worked with a GIS map to try and identify the source of an E. coli outbreak. Strike teams enter the “hospital” inside the Kern County Public Health Services Department where they investigate the cause of an E. coli outbreak during a mock medical emergency. A group of high school students expecting to get a tour of the Kern County Public health facility got more than they bargained for on Wednesday. Soon after the group’s bus stopped at the facility, KCPH Director Matt Constantine boarded the bus to welcome the students, who were surprised to learn what they were really there for: There has been an e-coli outbreak, and it was up to the students to discover the source. 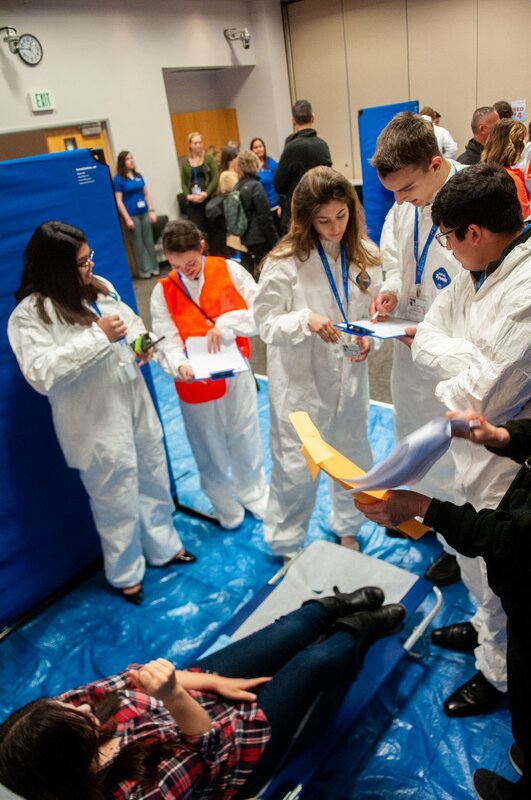 Students were immediately placed into Tyvek hazmat suits, split up into teams and let loose to explore several stations set up in and around the facility, including a hospital, restaurant, garden and auto shop. There was no real outbreak, of course. It was a staged event aimed at giving students in the Greater Bakersfield Chamber of Commerce’s Youth Leadership Bakersfield program a life-like experience of how the department would handle an emergency. Students were thrown right into the deep end at the start. The first step was the hospital station, where the students questioned several KCPH employees acted as patients suffering from e-coli. The department didn’t spare any details. Patients were shown with fake blood and vomit. From there, the teams moved to other stations around the department. The event was capped with a press conference, where students had to answer questions from news outlets about the outbreak. Valley Oaks Charter School student Marissa Cline said she was shocked to learn what the students had to do. “I was a little panicked, because everyone was yelling for us to get off the bus. It was kind of scary,” she said. Cline said she especially enjoyed getting to see the patients and questioning them. Golden Valley High School student Alexis Aguirre also participated in the event, which she said she enjoyed. Aguirre said she joined the Youth Leadership Bakersfield program this year so she could learn more about the different career options that are available. The Kern County Public Health department is just one of the several city and county organizations that students in the Youth Leadership Bakersfield program get to visit. The goal of the program is to inspire future business and community leaders. Patricia Marquez, chair of the Youth Leadership Bakersfield Advisory Council, said she hopes the students gain a better understanding through Wednesday’s visit of what happens when an emergency occurs.